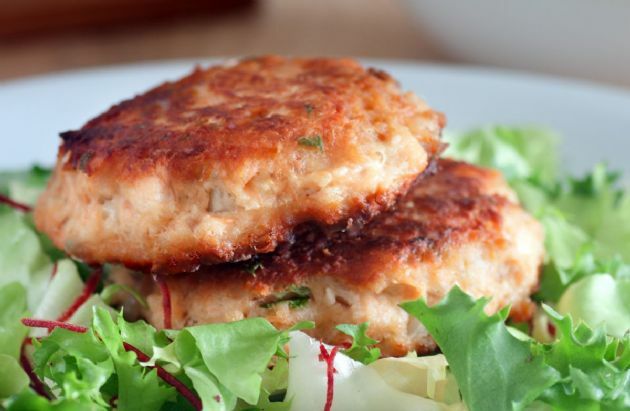 Like crab cakes -- but with salmon! Like crab cakes -- but with salmon! Mix salmon, scallions, herbs, Old Bay, breadcrumbs, and mayonnaise in a medium bowl. Salt & pepper to taste (though Old Bay is really salty, so I don't add salt). Carefully fold in the egg with a spatula until the mixture just clings together. Divide mixture into four patties, cover with plastic and chill in the fridge for 1/2 hour. Heat a bit of oil -- a tablespoon max -- in a skillet over medium-high heat. Fry patties until the outsides are crisp and browned, 4 to 5 minutes per side. Recipe submitted by SparkPeople user JCOOKSON.